Reference number for this case: 9-Oct-54-Saint-Chamas. Thank you for including this reference number in any correspondence with me regarding this case. Testimonys of various sources inform us that in the woods of the commune of Saint-Ambroix (the Gard), several hunters reportedly [...] having a vaguely human shape. When the hunters approached, the homunculus's rushed towards a phosphorescent craft which flew away at once and disappeared. Coming back a short time later the hunters noted that in the place where they had seen the "Martians", a certain number of seeds of odd appearance were strewn on the ground. These seeds were allegedly shown to various seed resellers of Saint-Ambroix, who were unable to identify any known species. According to various information, they would have been sent to a [...] to control the exactitude of this information, that some deny and others confirm. Mr. Pitot, Nîmes resident, saw yesterday in the night "something abnormal" in a street of the suburb, Edgar Mouton street. This machine which he was unable to identify in an absolute manner, suddenly rose in the airs and disappeared without any noise nor light. Saturday, October 9, at 08:15 p.m., a mysterious machine, coming from the direction of Cornillon and going to Istres, passed above Saint-Chamas at approximately an altitude of one thousand to fifteen hundred meters. This craft was disc-shaped of the size approximately of a plate seen at this distance. It was incandescent, letting escape a very thick smoke of fiery color which formed a long luminous trail. After having crossed Saint-Chamas, it climbed higher and disappeared suddenly above Istres. After the policeman of Nîmes who saw a stack of cigars soon changing into a quadrilateral from where red and orange gleams escaped, an S.N.C.F. [national railway] employee, Mr. Martinet, living in the workers suburbs of the farmhouse Mathieu, road of Avignon, had his glance attracted by a ball of fire which moved in the sky, in direction of the plate of Garons. The two authors indicate that on October 9, 1954 at 08:15 p.m., in Saint-Chamas in the department of the Bouches-du-Rhône, there was a sighting of a "disc letting escape a very thick smoke of fiery color," which disappeared suddenly. The authors indicate that their source is Le Provençal, October 14, 1954. 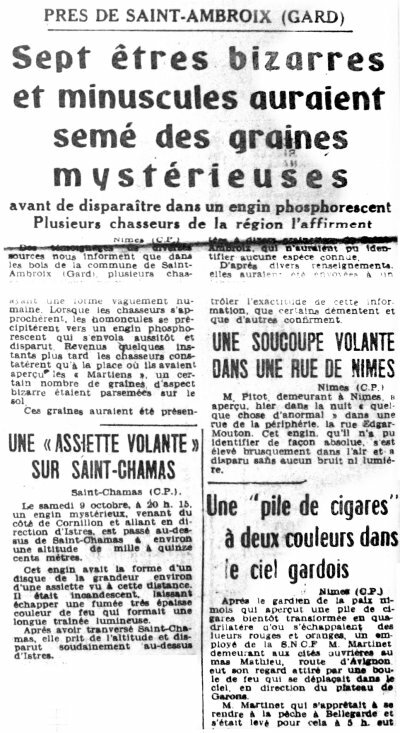 The Belgian ufologist indicates in her catalogue that in 1954, on October 9 in France in St Chamas and Nice, "at 20:15 one observes in St Chamas a disc letting out a very thick smoke of fire color, which disappears suddenly by taking altitude above Nice. At 23:15 Mr. Valicale observes in Nice a luminous craft moving at high speed towards the south. Mr. Soulié observes a disc resembling the full moon and leaving a luminous trail." The source is indicated as "M. FIGUET/ J.L. RUCHON: "Ovni, Premier dossier complet..." Alain Lefeuvre pub. 1979, p. 140". Luc Chastan indicates in his database that in the Bouches du Rhône in St Chamas on October 9, 1954, at 20:15 hours, there was an "Observation of a disc letting escape a very thick smoke of fire color and suddenly disapears." Not looked for yet. Meteor. [lp1] Article in the regional newspaper Le Provençal, France, October 14, 1954. [fr1] "OVNI, Premier Dossier Complet des Rencontres Rapprochées en France", book by Michel Figuet and Jean-Louis Ruchon, Alain Lefeuvre publisher, France, page 140, 1979. 0.1 Patrick Gross May 5, 2005 First published. 1.0 Patrick Gross March 8, 2009 Conversion from HTML to XHTML Strict. First formal version. Additions [go1], [lc1]. 1.1 Patrick Gross July 27, 2010 Addition [lp1].